For more than seven months, Josephine from Saint Clair Shores, Michigan, looked for work without the assistance of unemployment insurance. Laid off from her job at General Motors, she wrote earlier this month that she had applied for hundreds of jobs to no avail. At 60, she said she thinks her age made the job search more difficult — after being asked what year she graduated, Josephine seldom heard a peep from employers. As her resources dwindled, she worried that she’d lose her home. That all changed earlier this week when Josephine got the job offer she has been awaiting ever since she was laid off. She’ll start working again soon. Unfortunately, millions of other Americans are still looking for employment and have been cut off of federal unemployment benefits. Over the course of the last two months, many of my Democratic colleagues, faith leaders and advocates for the unemployed have told the stories of Josephine and the more than three million other Americans whose insurance was cut off after Republicans blocked an extension of emergency unemployment insurance last December. 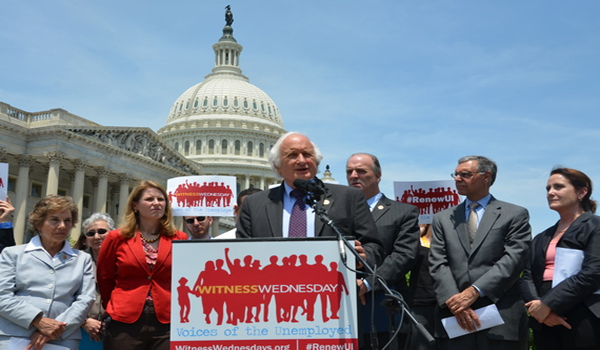 This week, we held the last of those Witness Wednesday events to raise awareness of the hardships that Americans are enduring and to urge Congress to act. Josephine described her experience last month in a letter to the Center for Effective Government, which has organized the Witness Wednesday summer series. She said that emergency unemployment benefits allowed her to lead a somewhat normal life as she sought new work. When she was cut off, she said she lost her sense of normalcy. Every week since Republicans blocked an extension of the program in December, an average of 72,000 more Americans are cut off unemployment insurance prematurely. The economy continues to recover, but the rate of unemployed who have been out of work for longer than six months remains near record levels. Never before has Congress allowed an emergency unemployment insurance program to expire with the rate of long-term unemployed as high as it is today. Democrats have met every condition that Republicans have set forth to extend the program. We have agreed to offset the cost of the program, despite the fact that House Republicans have passed more than $700 billion in unpaid-for tax cuts, largely for big corporations. We have agreed to extend the program prospectively, rather than retroactively. And we have urged connecting the legislation to a jobs package such as legislation to extend Highway Trust Fund. By wide margins, Americans favor extending the program. Still, Republicans continue to block a single vote in the House. The fight to renew unemployment insurance has always been about those who are most affected. This is about the forgotten Americans struggling just to make ends meet. Hundreds of people like Josephine have contacted my office to share their heart-breaking stories and ask for support from Congress. We hear them, we stand with them, and we urge House Republicans to end their resistance to an extension. Israel Changes Bar Code To Avoid Boycott!